Recorded a few months further into David Bowie's 1974 tour than the official "David Live" release, this now-kosher former bootleg provides quite a different experience to "David Live". There is a totally different ambience to the playing and Bowie's delivery. Despite being from the same tour, they are two very distinct performances. Apparently, before the "David Live" gig(s) relations between Bowie and his band were at a low ebb due to a pay dispute. There were also early teething problems with the innovative, adventurous stage set. By the time the tour reached Los Angeles many of these problems had been ironed out and everything was hunky dory, so to speak. Listening to it, you can tell. Maybe I am imagining it, but the band seems looser, more relaxed. The interplay between the omnipresent saxophone, Mike Garson's piano and the organ are excellent. Particularly on "Moonage Daydream". The guitar on it is improved too. The opener, "1984" has more "oomph" about it and "Rebel Rebel" has far less saxophone. More guitar-driven. "Suffragette City" sounds closer to its original, with a heavier, riffier intro. As indeed does "The Jean Genie" which rediscovers some of its original bluesiness. "Knock On Wood" and "Rock 'n' Roll With Me" are looser, almost edgier. The latter is almost a bit sloppy in places, with Bowie putting on a strange voice early on in the song, however. There is a bit of an "end of term" feeling about the album, with the band just doing their thing, man, as opposed to the tighter, slightly more nervous "David Live" offerings. Bowie's vocal delivery seems more pronounced, more theatrical. Which is odd considering he had dropped much of the on-stage theatricality that had hampered the earlier part of the tour. Check out "Sweet Thing". His personal performance on this and throughout the show seems more assured and at the same time more relaxed. More drugs or less I wonder? The backing to this track, again, just seems better - clearer and with the individual instruments given more space to breathe. Also, the idea was to turn to the whole thing more "soully". With that in mind, we see the first appearances of "It's Gonna Be Me" from the "Young Americans" sessions and a final encore track of the disco-influenced "John I'm Only Dancing (Again)". Most welcome they are too. Other than that the set list is pretty much the same as "David Live", with no "Watch That Man", "Panic In Detroit", "Width Of A Circle" or the oldie soul cover "Here Today, Gone Tomorrow". Earl Slick, the lead guitarist, seems more confident in his solos on this recording than on "David Live" Saxophonist David Sanborn the same. Heck, they all sound more energised. 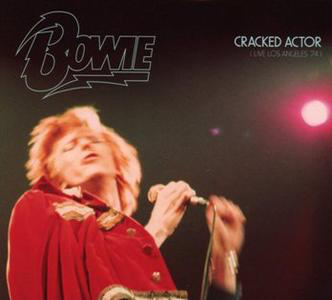 Listen to the Latin-tinged piano/guitar/bass bit in the middle of "Aladdin Sane". The instrumental bit in the middle of "Big Brother" too. 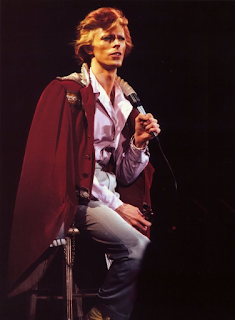 Contrary to many people, I have always loved "David Live". Maybe because I grew up with it and it for a long time my only Bowie live recording. However, this really puts it somewhat in the shade in places. Highly recommended. Fantastic sound quality too. You know what, though, I still slightly prefer "David Live", despite everything I've said, particularly the latest Tony Visconti remix of it, which is superb. The best thing is two own both of them and treat them as different entities. They both have their merits.